Meeting rooms come in all shapes and size; from small interview rooms to collaborative workspaces and large corporate boardrooms. Every business needs at least one private space where meetings can happen, whether between teams, managers and personnel, Heads of department or with potential suppliers or clients. The first stage of any meeting room design is agreeing its purpose. For small businesses the meeting room often has many purposes whilst larger companies with more floor space tend to have multiple meeting rooms and a boardroom. The purpose of the meeting room will greatly influence the layout, design, facilities i.e video conferencing and audio visual, type of furniture and décor for the room. You also need to determine the largest number of individuals who will be attending meetings. If you want space for 32 people, you will need a room with dimensions of at least 32 feet by 14 feet. 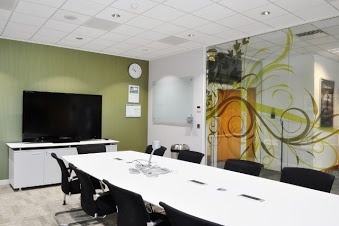 Make sure your meeting room design gives ample space for people to move around. You want people to feel comfortable and not hemmed in! The second stage of designing a meeting room is to decide the layout. A commonly used meeting room layout is a U shaped layout which enables people to sit around the three sides of the table to view presentations. If a screen is to be used a lot in meetings, then the layout must ensure that everyone can sit comfortably whilst viewing the screen. If your presentations are now mostly on laptop or ipad then you do have more flexibility in the type of meeting room design that you need. Create a meeting room that reflects your company personality and brand. Whether you are entertaining poeple outside of your company or using the room for staff meetings only, its important to reinforce the brand image at all opportunities. Trevor Blake provide the complete package for meeting room refits, from the design and planning, to decoration and furniture through to supply of video conferencing solutions and SMART boards. If you would like our expert team to help you improve your existing meeting room design or create a meeting room from scratch, please contact us for a free, no obligation quote.